It’s late February and we are preparing for another field trip to survey for smalltooth Pristis pectinata and largetooth P. pristis sawfishes, both of which are classified as Critically Endangered on the IUCN Red List of Threatened Species. The preparations are involved and exhausting, since we will be setting off on a three-week trip away from home. The equipment has to be checked, materials bought, local contacts established and a plan of attack drafted. Then we need to pack everything – and off we’ll go! 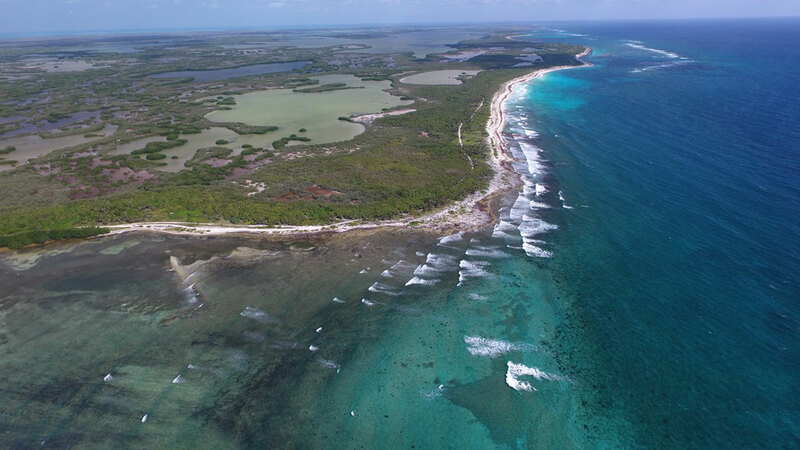 This time we are surveying two areas: the northern coast of Quintana Roo, where the Mexican Caribbean meets the Gulf of Mexico, a remote and isolated but extremely beautiful coast; and Bahía del Espíritu Santo, a large and almost enclosed bay that lies in the southern part of the state and belongs to the magnificent Biosphere Reserve of Sian Ka’an. Our team comprises two enthusiastic and experienced young female shark researchers, Melina Ricaño-Soriano and Paola Palacios-Barreto, and a new male team member, Miguel Tello. Each is a trained biologist with an MSc degree. Oh, and there’s me too, the project leader. With two large cradles of equipment, two drones, a large box of plastic tubes and our four small individual suitcases, we fly to Cancún and rent a large SUV, then set out to Chiquilá, the small fishing village from which the ferry crosses to trendy Holbox. 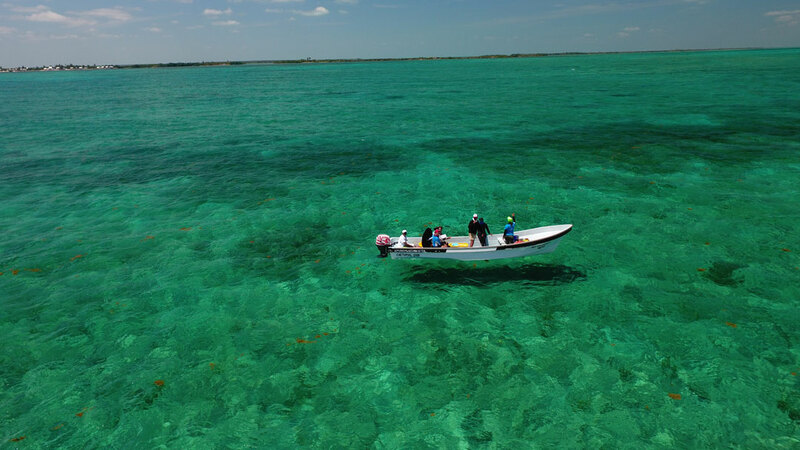 During the first week we survey the entire shore of the Yalahau Lagoon, a former nursery area for blacktip Carcharhinus limbatus and lemon Negaprion brevirostris sharks, as well as the coastal lagoons that stretch from Cabo Catoche to Boca Iglesias. The landscape is awesome – the waters of the ocean turquoise and the shallow coastal waters in shades of green to red – the birdlife is abundant and diverse and we can’t help feeling extremely fortunate to have a job like this, even though it doesn’t pay! We interview a few old fishers and learn from them that some 40 years ago sawfishes were common inside Yalahau Lagoon and in the shallow waters around Holbox and Cabo Catoche… But the most exciting news comes from a younger fisherman who claims he saw juvenile sawfishes in one of the inlets on the eastern side of the lagoon a year ago. This means that sawfishes might still be hiding around here! Our approach includes using small Unmanned Aerial Vehicles (UAVs, or drones) to try to spot sawfishes from the sky, since the water here is extremely clear and smooth. But even more effective is a modern genetic tool called environmental DNA, or eDNA for short. It has been proved that eDNA can be used to identify organisms in water, soil or even air samples. The principle is that all organisms shed cells and genetic material into the environment every day. Just think of how many cells we lose during a shower – flakes of skin, mucus, saliva, urine all go directly down the drain. The same happens to fishes in water. So in the areas we survey we carefully collect small vials of water in triplicate at as many locations as logistically possible. These samples will go to a genetics lab to be analysed. Using primers specifically designed to stick to small pieces of sawfish DNA, we check the water in each vial to see if it contains the DNA we’re looking for. Occasionally, when time allows and it is not prohibited by the management plan of each of the many protected areas we visit, we also set gill nets for 1–2 hours at a time and monitor them every 20 minutes to see if we by any chance catch a sawfish. All other animals are released unharmed after we’ve taken a photo for identification purposes, and if it’s a shark or a ray, we fit it with a plastic tag. 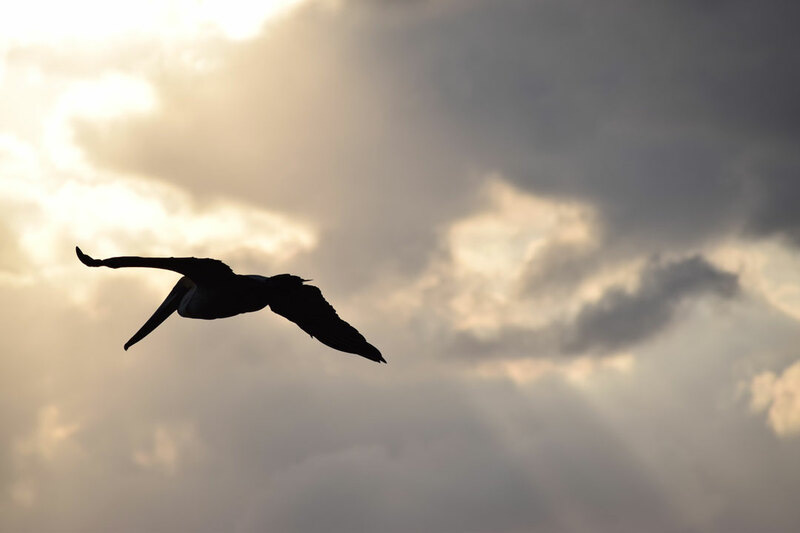 When we finish checking this area, we move to Isla Mujeres to complete our survey of the coast from Boca Iglesias to the continental shore just in front of this island, including several coastal lagoons and Isla Contoy, one of the most important seabird nesting areas in the region. Here we count on the kind help of Don Francisco Cobá, a fantastic character and old fisherman who knows the area like the back of his hand. 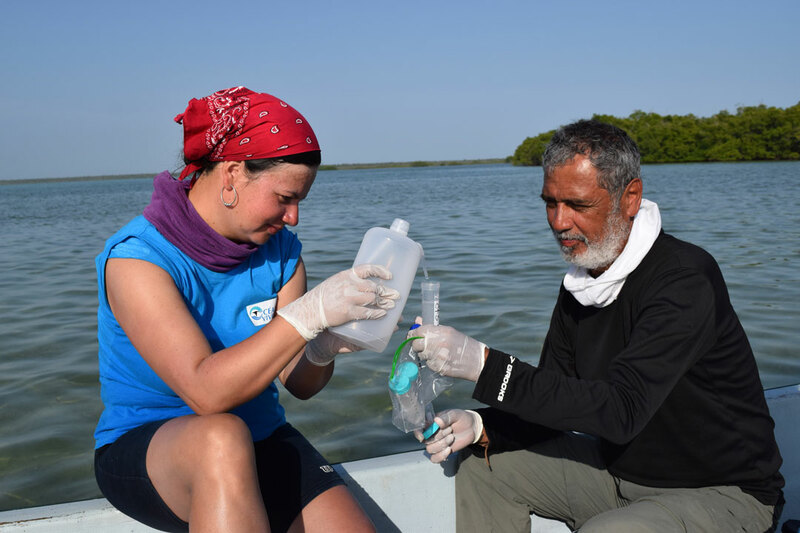 We still have not seen or caught any sawfishes, but we do manage to collect more than 240 water samples in all the nooks and crannies of the coast. Don Francisco tells us one or two anecdotes of large sawfishes that were caught around here many decades ago. We leave this part of the Quintana Roo coast convinced that some of our samples will have sawfish eDNA, since this used to be an area with an abundance of both the largetooth and the smalltooth species and there is still plenty of almost pristine habitat for them. We now embark on a six-hour trip south, towards another remote section of the Maya Riviera: a tiny fishing village called Punta Herrero in the southern part of Bahía del Espíritu Santo. This bay is definitely the jewel of our trip, isolated, almost uninhabited (only two tiny fishing villages in the whole bay and they are used only seasonally by lobster fishers) and as pristine as you can find in our modern world. We spend six days covering the entire shore of this bay as well as part of the coral reef along the shore to the north and south. 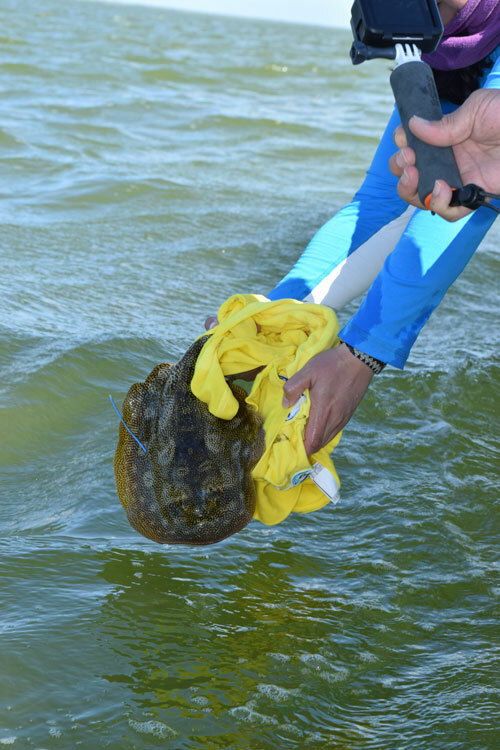 For six to eight hours a day we conduct aerial transects with the drones, collect water samples and tag or collect tissue samples from the Atlantic round stingrays Styracura schmardae that are abundant. The bay and the reefs around its entrance are a wonderful sight and we occasionally take a quick dip in the water to freshen up after long hours in the sun. The highlight of this part of the trip is an unexpected meeting with a juvenile bull shark in one of the channels at the deeper end of the bay. 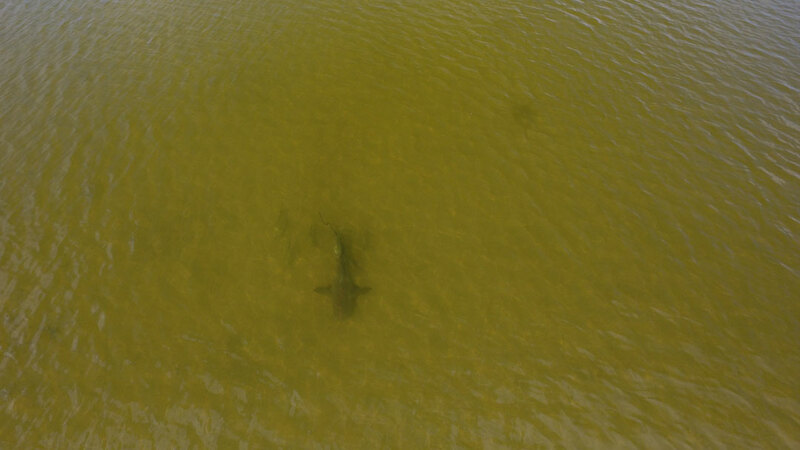 Flying a routine aerial survey, I spot a small shark in the distance inside a narrow channel that cuts into the wetlands surrounding the bay. The bays of Quintana Roo used to be important pupping and nursery areas for sharks 50 years ago, but fishing, coastal human development and pollution have all contributed to strong declines in their use by females as pupping areas. So we are elated to find evidence that some bull sharks are probably still born here and use its protected waters as a nursery ground. As I film the shark moving towards our boat, our fun volunteer from Oz, Be Bateman, who joined us for this last leg of the expedition, jumps into the water with GoPro in hand to try to film it underwater. But when I see the size of the shark close to her from the drone, I advise her to jump back into the boat – the shark is nearly the same length as Be and as visibility in the water is low, we don’t want any surprises!